The Motorized Throttle for MS FS9/FSX model 480763 product is offered by Flight Simulator Center (FSC) a business unity of Professional Show S.p.a., in Italy, which employs more then 60 people. In common terms, this product is primarily a B737 throttle, which can be used in multiple aircraft configurations. By the way, my contact persons at FSC are Leonardo Girardi and Luciano Napolitano. REMINDER: The purpose of the product review is to describe the features, functions, ease of use, and quality of this hardware component as an independent entity. It is reasonably compared to its aviation counterpart. This product review does not compare this product to any other similar commercial or private fabrication products. I received the unit on August 4, 2008 at 11:45 AM. The shipping container was made of wood crate, securely assembled. Top and bottom 8 inches of crate heavily covered with a layer of soft Styrofoam to protect crate and its contents. The Styrofoam was held in place by four straps and the wood case had a single strap. 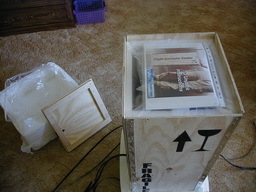 The condition of the crate was completely undamaged, looked new, although the Styrofoam protection was slightly scarred. This is what I call quality packaging to the extreme, excellent. The crate was made of wood; corners are protected with metal corner strips from top to the bottom. 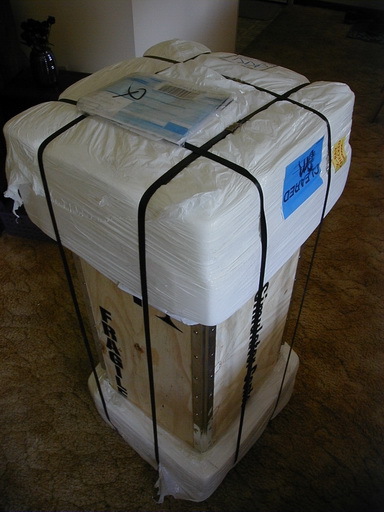 A single packaging band was placed from top to bottom of crate. 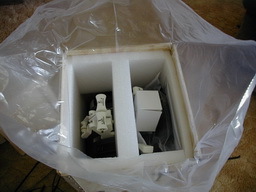 To open the crate I cut the outer straps and removed the top Styrofoam protection. I removed the top lid by unscrewing eight screws and lifting the top lid. Looking inside the container I noticed the contents were completely surrounded and sealed by a heavy duty plastic bag. The TQ was braced with Styrofoam. The unpacking instructions lay on top. Again, excellent packing and at this point I would give it a Five Star rating for packaging. I opened the bag, removed accessory items, which lay on top. The additional items included were the 120v AC to 240v AC adapter, AC cable, USB cable, nut wrench and installation instructions. After removing the Styrofoam braces inside the top part of the crate I looked for any evidence of damage from shipping. None was observed. Following the unpacking instructions I removed the top pieces of Styrofoam and pulled out the TQ unit. My first impression…. WOW!!! That looks fantastic, can’t wait to plug it in and start flying. I returned to my senses and focused into the review mode. 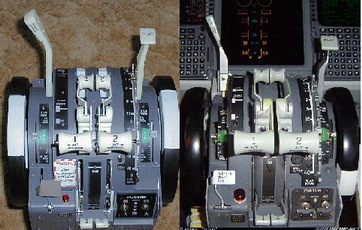 I looked over the TQ carefully and realized, although the product looks extremely close to the original B737 TQ, there are some indications as not being a real aircraft part i.e., the handles on the levers imprinting are not well defined; no metal casing, mostly made of wood, plastic and some metal; and the trim tab indicators are not functional. Actually I knew this before receiving the unit, although the TQ has two workable STAB Trim switches, they are nonfunctional, they are not wired to a interface. But then again we’re not comparing apples to apples. Overall the quality looks fantastic. I continued to look over the TQ; the switches and levers all seem to be well in place, the markings compared to the real unit were almost identical. If you look at the photo below and get past the carpet and my bad photography, you can see the excellent comparison of the FSC TQ and the real thing. Before gettng into the fun of plugging in and flying the throttle, I made sure I read the instrunctions. The instructions are fantastic with easy step-by-step instructions. To begin, I installed the TQ Driver/program, with the following next steps in sequence; I Started MSFS9, went directly to FS9 default B737-400, set FSC TQ Configuration, restarted FS9, calibrated TQ, and restarted FS9. I started a flight with all the FSC TQ and its components working. I did all this within 7 minutes. That’s close enough to plug and play as far as I’m concerned. Another FIVE STAR from me, for plug and play. I used FS9 and FSX. Besides a slight difference in the way the driver installed both are extremely similar. There was an issue with FSX as it would lock up right after the Splash Screen. After some investigation with Luciano Napolitano (author of the drivers) it was discovered it was a problem with my PC's. Luciano changed the driver so the data pooling time was increased from 10 milliseconds to 20 milliseconds. 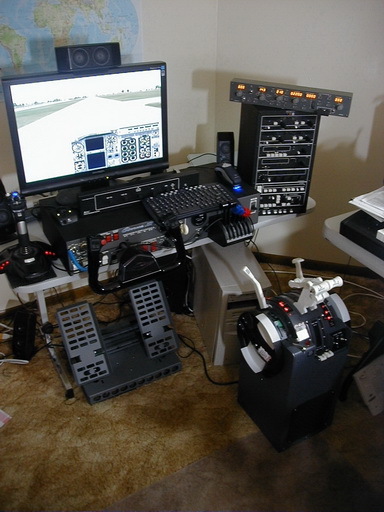 The performance and configuration of FS9 and FSX are very similar. I refer to both as one. First I tested the unit to see if it functions as advertised. In short "It did!" 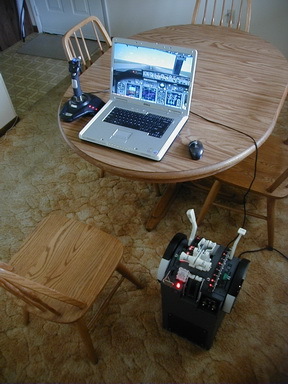 The test was performed on three computers, different configurations; primarily all MS XP and XP Pro, including a quick setup using a laptop. My first test was with the FS9 default B737-400. It was a delight, and after about 1/2 hour in the air, I felt completely at home with the FSC TQ. My thought was, "How could I fly a B737 again without this TQ?" The process of full thrust on take off, flap settings, adjustments after take and setting the A/P, watching the A/T at working was amazing. The approaches whether using A/P - A/T or flying by the seat of your pants was a natural feeling. Total time spent with the FSC TQ and on the following aircraft's was over 15 hours. I wanted to see how quickly I can set this up with my laptop…. Same experience as on my other PCs, up and running in no time. Does that mean it’s portable? Probably not. What do I LIKE about this product: WOW, it's almost perfect. When I first looked at it, I couldn't believe my eyes. I couldn't wait to take it out of the box and plug it in. It looked fantastic, and had a very nice feel to it. 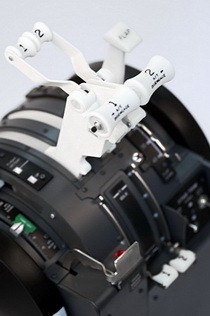 The levers are a duplicate of the real TQ. Moving the flap lever was identical to the real thing. Everything positioned as the authentic TQ. Response was fantastic when flying. I was amazed the versatility of the configuration capability, setting it to different type of aircraft. Dislikes: The handles on the levers imprinting were not well defined, I thought it could be done just a bit better. As a preference at least in my opinion, I would of liked two things to be improved: First, the thrust levers with a bit more resistance. When the A/T is OFF, at about 75% of full thrust setting, occasionally the thrust levers would slide forward (increasing thrust). Although there is a setting in the TQ configuration for resistance with servos, it just didn't cut it for me. The second item improvement is the Fuel Valve Shut Off levers. I would have like them to be spring loaded. I took the opportunity to take the unit apart and look inside, how impressive, heavy duty servos, the wiring; nice and neat and organized, and the gears heavy duty. 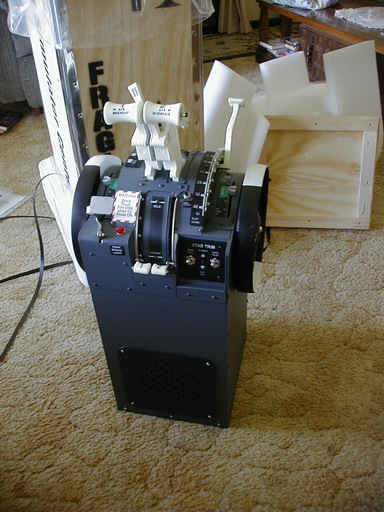 There is one servo quite large; it even has a metal gear box attached to it. The framework was extremely sturdy. If I had to build this, first of all it would take me forever, and to find and build the parts would take months. I asked Leonardo, what’s the shipping time? He said there are 60 available to ship now, no waiting! It get’s better. Yes, like the commercials on TV “But wait.” The warranty; 12 months, almost unconditional, if you’re having problems, they will send you replacement parts, free, they will repair or replace the unit. I talked to Leonardo about this, this is unbelievable, and he said his company of 25 years, considers the satisfaction of the customer most important, even after one year. I’ve been exposed to many flight-sim parts. I’ve seen the good, bad and ugly, but this product has definitely been one of the more interesting ones to work with. The FSC TQ is everything Flight Simulator Center claims it to be, no unexpected disappointments. It is beautiful. As mentioned before, the TQ becomes part of the simulated environment, it definitely adds to the realism you try to create. I love their warranty and philosophy, standing behind their product. It gives me a sense of security knowing my investment will be long lasting. In the final analysis, “Would I personally buy and be satisfied with this product?” The answer is yes! I want to thank Leonardo Girardi and Luciano Napolitano for giving me this wonderful experience and my congratulations for a fantastic product.